Altar of Resistance by Samuel Marquis. Samuel Marquis is a bestselling, award-winning suspense author. His books include “The Slush Pile Brigade,” “Blind Thrust,” “The Coalition,” and “Bodyguard of Deception.” He works by day as a VP-Hydrogeologist with an environmental firm in Boulder, Colorado, and by night as an iconoclastic spinner of historical and modern suspense yarns. He also has a deep and abiding interest in military history and intelligence, specifically related to the Golden Age of Piracy, Plains Indian Wars, World War II, and the current War on Terror. Former Colorado Governor Roy Romer said, “Blind Thrust kept me up until 1 a.m. two nights in a row. I could not put it down. An intriguing mystery that intertwined geology, fracking, and places in Colorado that I know well. Great fun.” Kirkus Reviews proclaimed The Coalition an “entertaining thriller” and declared that “Marquis has written a tight plot with genuine suspense.” James Patterson compared The Coalition to The Day After Tomorrow, the classic thriller by Allan Folsom; and Donald Maas, author of Writing 21st Century Fiction and two novels, compared The Coalition to the classic political assassination thriller The Day of the Jackal. Espionage, intrigue, romance, battle, and more. Altar of Resistance has a difficult time finding one genre to fall into. To start off with I see myself reading this one again. And I don’t read books more than once very often these days. This is the second of Sam Marquis’ WWII Trilogy, all standalone books, and it’s going to be hard to beat. That third one is going to have to be something else to surpass this one. 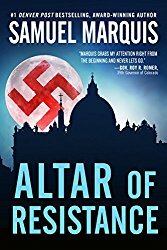 Altar of Resistance by Sam Marquis is about the Occupation and Liberation of Rome in 1943-44 Italy. The story is told through the viewpoints of four main characters: Pope Pius XII (sometimes called Hitler’s Pope), SS Colonel Wilhelm Hollman (a character based on fact), US Army Special Services member John Bridger, and Roman Resistance fighter Teresa Di Domenico. The last two are fictional characters, but in the book share a secret with the SS Colonel. Having been a World History teacher and taken a semester of Nazi/Fascism class I know a little bit about WWII and what happened in Italy. Marquis uses factual events to give his story life or maybe he adds fiction to the facts to make it easier to handle. You read and decide which. Either way you look at it, he brings the subject to life. We don’t get just a superficial story from Marquis to create a thrilling read. He gives us layers to add dimensions to each character, even the minor ones. He even has you like the Nazi torturer/interrogator at one point. I think Marquis’s fiction elements actually make sense in context of history. We see the Pope silent against atrocities not only throughout Europe but in his own city. Marquis gives us reasons why. SS Colonel Hollmann is based on fact as far as his existence but how he is used and his complexity is believable. He is perhaps my favorite character in the book. John Bridger is a tough Army commando who kills without hesitation but tries to keep his humanity. And Teresa is her father’s daughter, but which father does this good Catholic girl take after? We see the war and the battle for Rome from every possible level and realize not one could achieve success without the other. We see how a girl leads to the success of the Allies in Italy, not a farfetched idea. We see how love exists and even sprouts during great turmoil, and how it doesn’t die regardless of tragedy. There are no bogged down moments during this read. I didn’t find myself having a difficult time making my way through a passage to get to the next. The only parts that even remotely slowed me down were later chapters involving the Pope, but that is in part due to the success of the author in the character’s portrayal. Got to love a Pope but man can he be frustrating at times. The only bad thing about the book is not knowing the future of all the characters. Sam Marquis does give us details of the factual characters and what happens to them, but the fictitious ones perhaps are left unknown because we may seem them some other time? I’ve read all but one of Sam Marquis’ books. This is his best one yet. If you’ve never read historical fiction, this is a way to start. So far this is my book of the year and I’ve read four so far. It’s going to be difficult to top this one. It had all the elements to keep me engaged. Visit #1 Bestselling Author Samuel Marquis at http://samuelmarquisbooks.com/.